Every September without fail it comes. The oppressive black shroud of funk that envelops my heart, mind, and body almost suffocating me for months. I don't anticipate its arrival but I prepare for battle once it arrives like clockwork. I arm myself with prayer, buck up with a good attitude, and delve into the word. Life happens and I lose. Unexpected expenses knock me down; illness sends a grenade in my vicinity; clumsy accidents cause me to almost lose my sanity; t.v. images of Black Friday madness has me ranting at humanity; commercials of Christmas sales in September make me nauseous, and mounting stress weakens my resolve to win the fight against the funk. This year I deployed a different, more effective tactic. I chose to be the change I wanted to see. Instead of complaining, ranting, and raving I took action. With an open heart, much prayer, and financial help from my daughter I was able to travel on a weekend mission trip to Tecate, Mexico with 87 people from Cottonwood Church. I was also given the important duty of documenting the entire trip with my photography. 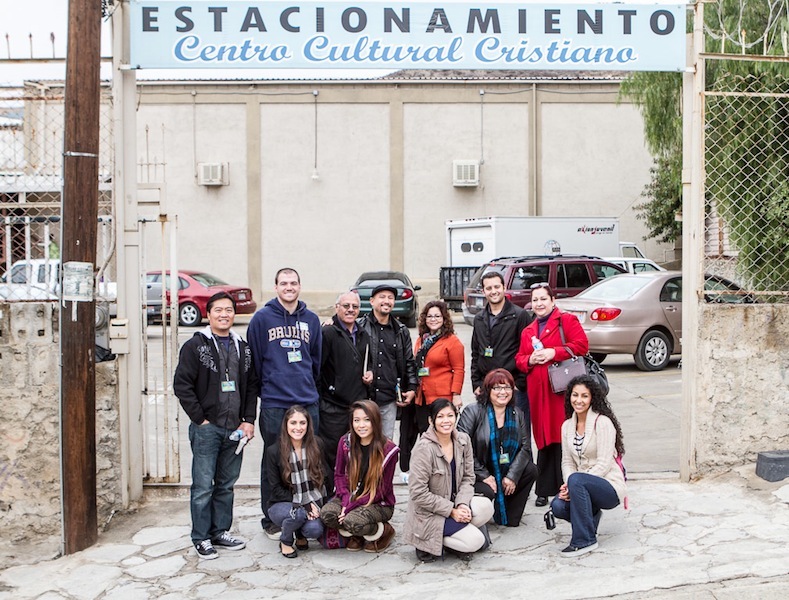 Every year Cottonwood sends several teams to partner with the churches in Tecate to serve the needs of the community. Serving others is what I've always called "love in action" and I was blessed to be part of a team who exhibited the true essence of serving. My team of 9 people: Robert, Julie, Patti, Irma, Sylvia, Justin, Victor, and Christabel, partnered with Pastors Filiberto and Lorena Ferreyra's church, Centro Cultural Cristiano. There was a cohesive element to our team that I've never experienced before. We worked together with the ultimate goal to serve without complaints, irritations, or grumblings. 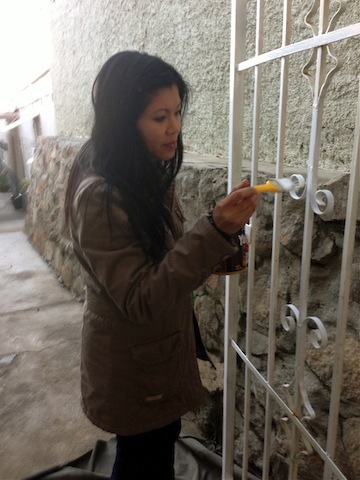 It was through our common love for God that we poured our hearts into serving the pastors and the community in Tecate. Upon arriving in Tecate on Friday afternoon we were immediately put to work by filling red bags with toiletries to be given to the community on our scheduled outreach the next day. We met with their Outreach team, split up into different groups, and walked the neighborhood streets knocking on doors to show people love and caring, providing prayer to those who requested or needed it. The inclement weather paused long enough for us to walk on unpaved, uneven, and muddy streets sometimes trudging up hills to reach houses nestled on top. We met families: single moms with young children, a sick older woman who prayed for someone to come and help her, young and older men, and grandmas taking care of their grandchildren. They were no different than us and we wanted them to know they were loved no matter what situation they were in. I noticed the hearts of the people who opened their doors to us were more open to what we had to offer than the ones I've encountered in California. The guarded expressions so commonplace at home was missing in the visages who greeted us in Tecate. Sure, they were wary; but once they realized we were there for the sole purpose of showing them love and providing prayer they opened up to us. My team had the privilege to help paint a hallway in Centro Cultural Cristiano Church. None of us expected to paint but we were ready to work despite the 40 degree weather and waning afternoon light. We unanimously agreed that we wouldn't stop until everything was painted. Afterwards, we took inventory of our appearance and laughed. Our clothes and hair weren't unscathed in our painting duties but none of us cared. I'm keeping these boots and never cleaning them as a tangible reminder to always exhibit a servant's heart. the people of Tecate are beautiful inside and out. to "serve unconditionally and love abundantly." I can't pick & choose whom to serve. serving unconditionally is essential in attaining the true spirit of Christmas. What wonders it did to my scrooge-y bah-humbug heart. a team can operate with the heart of God as the common element. It was refreshing to be surrounded by people who didn't complain, was ready to work, and was willing to sacrifice their comfort for the sake of other team members. the most effective leaders are those with a humble servant's heart. It's Christmas morning and I'm still basking in the afterglow of last weekend's mission trip. Serving others in need is the gift of giving--the true essence of Christmas. I choose not to let the afterglow of the lessons I've learned dissipate into the murky depths of my busy and distracted life. In 2013, I'm going to make a conscious effort to sustain the life giving flow of my servant's heart. Merry Christmas, everyone!